As comic book/superhero movies continue to do massive business, more and more young stars are throwing their names in the hat for various roles in the hopes that the studios will take notice. Though this may seem like a bit of a futile venture, it’s important to remember that it has worked out for actors (Vin Diesel in Guardians if the Galaxy, for example) in the past. 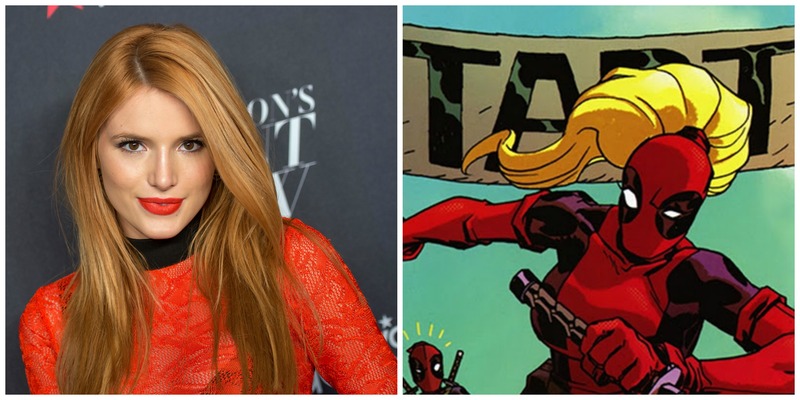 The latest to show interest is 18 year-old actress/model/singer Bella Thorne, who expressed her desire to play a “badass Marvel character” while speaking to Moviefone about her next project, Ratchet and Clank. Specifically, she mentions a female take on Deadpool. I’d be so down to play like a badass Marvel character. Any type of badass female in live-action, like Cora is in this movie [Ratchet And Clank]. I also like playing roles that are very rebellious and real. So it’s good when you really show teenagers for how they actually act and how they actually talk. Honestly, if I could just play a female version of ‘Deadpool’ – any character that’s a female version of ‘Deadpool’ – I’m so down! Though Thorne may not be aware of this, there actually is a female incarnation of Deadpool in the Marvel comics universe. Wanda Wilson, AKA Ladypool, is the Earth 3010 version of the Merc with a Mouth, and has teamed up with her male counterpart on several occasions. Could we possibly see her appear on the big screen one day? We sure hope so. Tell us, do you think Thorne would be the right actress for this role, or something similar? Sound off below and let us know.